Lovage is a strong aromatic spices, but also very beneficial herb .. all its parts have significant healing effects, both for women and men ..
Lovage is a perennial that grows in good conditions up to two meters in height and in a few years to grow robustly. It likes moist soil aeration and sun or shade. Simply multiplies the seeds, if not every year the fruits removed before maturity, the time we would be able to expand the garden too. Tradition of growing lovage is big in Europe, previously was often found in the monastic herb gardens, where it was used both for the production of herbal liqueurs, such as spices, but also as a medicine. Its flavor is distinctive and very beneficial healing effects ..
One of the most beneficial properties lovage is favorable impact on our digestion. Improves digestion and stimulates the production of digestive juices. It can help people suffering from loss of appetite, stomach and gall bladder insufficiency, feeling of fullness after meals, and generally slow digestion. It is also an effective tool in flatulence, for this purpose, we can add the leaves and seeds to food, or after meals to prepare weaker tea from the leaves and seeds, or roots. Tea from lovage has significantly diuretic and thus cleansing effects. Our established body rids toxins, purifies the blood and is beneficial for individuals suffering from articular problems such as rheumatism, arthritis, or gout. For this purpose, we can use all parts of the plant, but the most significant effect in this case root. Briefly boiling the dried root, prepare the tea that we drink several times a day. The root can be eaten when fresh but, just when you peel and cook as vegetables, such as soup. Detoxifying effect may occur even slightly increased sweating after eating, when leaving the body of harmful substances. It is often added to herbal mixtures to problems with urination, kidney and prostate. Pregnant women, however, he should rather avoid. 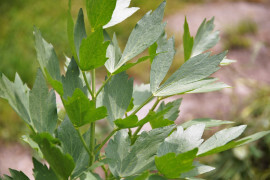 For external purposes, lovage is used rarely, and that his strong decoction, which is added to the bath as a deodorant. Some healers but bath with decoction recommended for people suffering from the above mentioned articular problems. Taste lovage, especially its leaves, is often compared to the flavor maggi, so he also sometimes called "Maggi herb". Most notably, the taste is said to feel when your bread with cheese put some fresh sheets. Fresh and dried leaves are great spices to flavor soups and sauces to spreads, meat dishes, or legumes, it is also suitable for salads or as a cooked potatoes or mashed potatoes .. Its aroma is strong, so add it to quite a few dishes. Lovage rhizomes and peeled fresh root can be edited as vegetables, preferably chopped and added to soups. Fruits - lovage seeds have a slightly sweeter flavor than the leaves. Used both to flavor dishes and for the production of herbal liqueurs, which add a spicy sweet flavor. Suitable are also in salads or cooked potatoes, some regions are used as a spice for flavoring meat. Its traditional use as seeds are ingredients for the production of perfumes. All parts of the plant can be dried for further storage. Leaves and rhizomes can also freeze for later use. The dried leaves are stored in a dark container to retain the green color. Lovage is the spice, which many of us have come to taste as they get older .. those who bought his distinctive aroma eventually takes, it will find it a great help not only in the kitchen but also for your health.